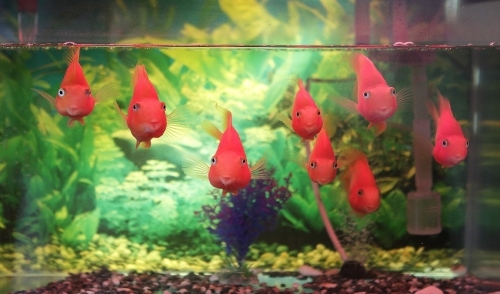 Share "Good Bacteria: The Benefits It Can Have on Your Fish"
It may seem like the cleaner an aquarium is, the better it will be for fish, coral and other tank residents, but in reality all fish and other aquatic guests need certain beneficial bacteria in their environment in order to thrive. But how do bacteria actually help your fish, and how can you be sure you have good bacteria in your tank? As waste material decays, it produces ammonia, which is highly toxic to fish and can result in damaged fins, inflamed gills, swollen eyes, appetite loss lethargy, algae blooms and eventually death. Even small amounts of ammonia can be critically dangerous for fish, but beneficial bacteria break down that ammonia into nitrites. Nitrites are still highly toxic to fish, but other types of bacteria then break down the nitrites into nitrates, which are not as toxic. Other filtration methods can then help remove nitrates to keep the water quality at appropriate levels for healthy fish. Adding hardy "starter" fish to the tank, species that can withstand higher ammonia and nitrite levels until the tank has cycled properly. As these fish settle in to the tank, the natural biological process of filtration and bacterial growth will begin. Adding a cupful of gravel or substrate from a healthy, cycled, balanced tank into a new tank. This will introduce a bacterial population into the new tank right away, and as wastes accumulate, that colony will continue to grow. Rinsing a new filter pad in healthy, balanced tank water before using it in a fresh tank. Bacteria from the balanced tank will adhere to the new filter pad and be subsequently introduced to the new tank right where they are needed most, in the filter. Adding premade probiotic mixes of suitable bacteria to the tank water. These mixes are available at pet stores and aquarium hobbyist stores. Read the instructions for bacterial introduction carefully, however, to be sure you add the proper amount of mix for the tank size. It can take several weeks for good numbers of beneficial bacteria to grow in a clean, new tank, and it is best to be patient and let the colony grow appropriately rather than rush the formation of the nitrogen cycle. Rushing can create rapid changes in water quality that will shock and harm delicate fish and corals, but with a bit of patience you can create a healthy water balance with good bacteria for your aquarium to thrive.